When we realize that we are not, as I like to call it, “Directors of the Universe,” we can begin to see all of the wasted energy we put into trying to orchestrate and control everything happening around us. While we do have control over which decisions we make, as we know, there are many other variables that we cannot, including the past, and to a large extent, other peoples’ actions. The sooner we learn and accept this and live accordingly, the sooner we can reduce unnecessary suffering in our lives. My significant other often points this out to me when I am struggling with being caught up in a problem. On the one hand, it’s important to be in the moment and to cope effectively and solve problems when possible, but when you’ve done all you can, it’s like he says: “In six months, this will be a distant memory. Your past.” I find some comfort in that. In the grand scheme of the Universe and time, at some point in the relatively near future, this situation will no longer be so powerful or have a hold on me. When it comes to being willing and radically accepting the moment, we must turn the mind again and again, because it will naturally resist and doubt. 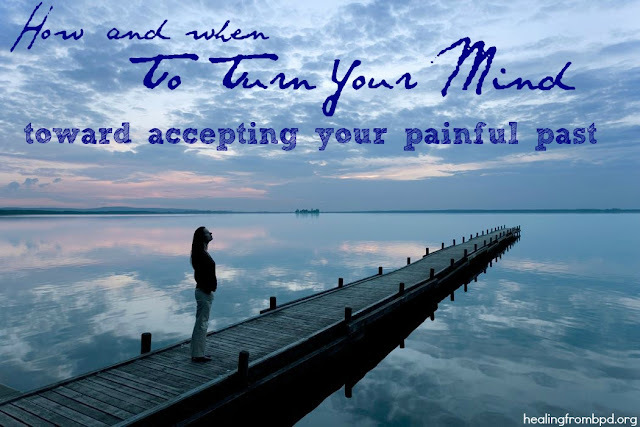 It’s a natural process for the mind, and in turning the mind, we retrain our way of thinking toward acceptance and peace. Thinking if we stay on the path of our own, personal version of reality, things will somehow miraculously shift to the way we want things to be./Not accepting is trying to control the world to feel more comfortable. Honestly, it wasn’t until recently that I realized that I have been doing exactly this with regards to my family. From birth to age 18, I lived in Massachusetts, from 18-35 (present), I’ve lived in California. I ran away to California for a number of reasons, the first being I always wanted to live here, and when I turned 18, I was like a bat out of Hades. The second was because I wanted to be as far away as possible from all of the memories and heartache that Massachusetts held for me. In leaving, I naively left things as they were in 1995 in my mind. Everyone stayed stagnant. No one changed. I even had dreams that people who had passed were really still alive — I was just far away from them. I have been living in extreme forms of denial. My Mom’s health has gotten worse (I didn’t want to believe it), people are getting older, and some have passed away. Opportunities to watch over and mentor young ones in the family are slipping away as they get older and become adults themselves. I don’t know if the 18 year mark is monumental for me, but I actually feel ready, for the first time in my life, to turn my mind toward accepting the reality of my family — their struggles, their lifestyles, and all of the memories that my home state holds for me. I am ready. I never imagined this possible before. In fact, I never even acknowledged the denial I was in. This is big. If I can be willing to turn my mind on this one, you can with whatever reality you’re not accepting. Here’s a video I posted before called the Conveyor Belt Mindfulness exercise. It’s a small way we can practice turning the mind. As we grow in confidence by practicing like this, we can apply it to those bigger things we need or want to accept. I am really excited about how the Turning the Mind mindfulness skill can help all of us to better cope with life as it is. What reality are you not accepting in your life? How could practicing this skill help you and open doors in your life? Thank your for this blog/site. I was supposed to do DBT this year but chickened out, partly because I could not figure how to keep my job and look after my family and also manage to have time to rest enough and do DBT sessions AND find energy to make excuses to people about not being available in those times. Last year a strange combination of events suddenly triggered a whole lot of painful things to come back and I realised I was acting pretty BPD. I am in a foreign country, with a different language, which makes it harder to feel OK about going to a DBT course. I am kind of coping as I learned some other mindfulness exercises a long time ago, but it still gets really overwhelming sometimes. This week was really tough and I had about 20 buckets, many used multiple times, during the few minutes: Fear, panic, loniliness, sadness, compassion for myself, shock, feeling like a loser, wanting so much to get really close to and love and also to fight with certain people in my life who are just people in authority not lovers or even friends, wanting to explain myself to people and lots more fear, panic and sadness. I can see why they call it radical acceptance. Your each and every article seems as if is written for me. I left myjob due to an argument between me and my super boss and the argument became an igo issue between both of us. I was not able to handle his behaviour towards me and hence left. But I am not able to leave the feeling that because of him I had to leave my job. I m stuck with this stupid idea that because he knew about my mental illness, he deliberately created situations for me so I resign voluntarily after feeling lost. I really like when u writes, " we cant control things, the sooner we accept it, less will be our suffering"
Hope I am able to overcome my past and start living in present. I really hope you have connected with the resources that you need. Thank you for reading and commenting. So glad to hear that you find some comfort in being able to relate, Jeevs. I'm sorry you had such an uncomfortable work situation. They are unfortunately all too common and very challenging for those who are emotionally sensitive. Glad you're working on overcoming the past and living in the now. Looking forward to learning of your progress.